With multiple awards collected in recent years, igus has shown the results of using a combination of user-oriented function and advanced design simultaneously in its products. Last month, 3 igus products, the chip-proof R4.1 Energy Tube, compact DryLin SLT linear guide, and mounting and transport frame ReadyChain rack were selected after 49 jury members reviewed 4,615 products, communication designs and packaging entered by participants from 55 countries. Since 1987, 31 igus products have been chosen for the award, which distinguishes products with a high degree of invention, design quality, material, ergonomics, functionality, and environmental compatibility. The R4.1 light provides cable protection in extreme environments, while still making movement and maintenance easy. The lid of the enclosed tube can be flipped open on either side, allowing for easy access to cables and hoses. At the same time, they are designed in a way that virtually no chips can pass to the interior. In a leakage test, only 2.7 grams of chips were found inside the tube after 250,000 motion cycles. The tube is lightweight, about 25% lower than comparable systems, but remains highly stable, allowing cable fill of up to 17 pounds per foot thanks to a double-stop system with large contact surfaces, keeping the load optimally distributed. By utilizing a lateral arrangement, with the lead screw next to the linear guide system, the DryLin SLT offers a minimum installation height of just 20mm, and structural widths of only 45mm are possible. The compact design is extremely light, weighing in at just over 5 ounces. The flexible system can be driven manually or with optional motor, and the smooth operation can move at a maximum speed of 5 ft/minute. The lead screw, mounted on ball bearings, is available with trapezoidal or high-helix threads, and a variety of thread pitches are available from stock. Due to its high efficiency, small size and lubrication-free operation, the DryLin SLT is ideal for automation tasks in food and beverage processing equipment, vending machines, and a variety of other applications. For nearly 20 years, igus has been providing pre-assembled ReadyChain Energy Chain Systems®, reducing purchasing and process costs in a variety of industries. In order to install the harnessed system even more quickly and more easily for the customer, the ReadyChain rack was developed. The transport and mounting frame is comprised of a modular system of supports and braces, which are able to telescope to adjust for length or height at any given time. Various latching mechanisms are available to ensure the proper mounting of any component. The modular nature of the rack allows for easy adjustments by the customer of alterations become necessary. If the machine happens to be discontinued by the customer, the frame can be broken down into component parts to be reused; a sustainable use of resources and environmentally friendly alternative to waste and disposal of the frame if it were not recycled. The iF design awards rank among the largest design competitions internationally. The awards span three categories, product design, communication design, and packaging design. In these categories, thousands of entries were submitted from applicants spanning 55 countries in 2014. 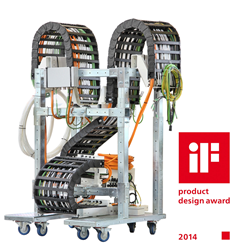 Technical innovation honored with the iF design award testify to functionality coupled with sophisticated style.